The question is often asked “what’s the best cartridge for 1000-yard Benchrest”. This immediately stirs a debate between fans of the “Big Thirties”, 6.5mm and 7mm advocates, and a few staunch 6mm defenders. In truth, a wide variety of cartridges, from the 6mmBR all the way up to .338 Lapua magnum, can do well at 1000 yards. However, there is clear statistical evidence that magnum-class 30s are still the top dogs in the 1000-yard game. Steve Shelp, who shoots with the Hawks Ridge Gun Club in North Carolina, has amassed statistics from years 2000 through 2006, recording all the calibers and chamberings used in the matches of the North Carolina 1000-yard Shooters Association. The data is further sorted by Light Gun (LG) and Heavy Gun (HG) classes. Steve has even been able to filter the data to include Relay Winners and Shootoff Participants. Steve has also created tables that show the Top 30 Groups and Scores in both LG and HG classes. 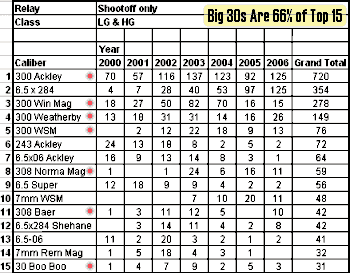 Below is a table showing the Top 15 Chamberings among shootoff participants, for combined LG and HG Classes from 2000-2006. We have totaled the Big 30s in this group of 15, and the large 30 Calibers (red dots) represent 66% of the total. There are 2064 entries in this set of Top 15, and 1355 are 30 Calibers. 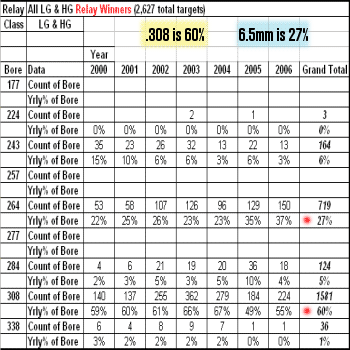 The next chart includes ALL LG and HG Relay Winners from years 2000-2006. Steve has sorted the data by bore diameter. The two dominant calibers among Relay Winners are: 30 Caliber (.308) at 60%, and 6.5mm (.264) at 27%. Presumably most of the 6.5mms are 6.5-284s, but there are some larger 6.5mm wildcats as well. NOTE: When you look at Light Gun Relay Winners only, the percentage of 6.5mms rises while the percentage of 30 Cals falls. Overall however, the big bore 30-Caliber rifles are still “King of the Hill” in 1000-yard competition. Steve Shelp’s data is contained in three Microsoft Excel spreadsheets. Click the links below to download the collected 2000-2006 data. Share the post "Winning 1000-Yard Cartridges"
Our friend Boyd Allen recently tested the new Carb-Out™ product from SharpShoot-R Precision Products on a rifle that had stubborn carbon fouling. Boyd had previously applied conventional solvents which did a good job of removing copper and conventional powder fouling. However, when examining the barrel with a borescope, Boyd saw heavy “burned-in” deposits of carbon. In this situation, Boyd observed, scrubbing with an abrasive such as Iosso or JB would normally be required. But Boyd had recently received a sample of Carb-Out™ from Terry Paul, owner of SharpShoot-R. Boyd decided to give it a try: “After working with a nylon brush and patches, getting all that I could out, I was able to see heavy carbon next to the lands, extending forward. This I removed by wetting the bore with the nylon brush, letting it soak for 20 minutes, and brushing with a bronze brush. I did this twice. Previously I would have expected to have done a lot of strokes with an abrasive to get the same result, since this was a worst case situation. Being able to to remove hard carbon without the use of abrasives is a ‘great leap forward’ to steal a phrase”. While Boyd used Carb-Out™ with a bronze brush, Terry Paul says the product is designed to work well without brushing. For the typical type of carbon fouling seen in barrels, Terry says: “You simply put it on a patch or a mop and swab it thru the barrel. Carb-Out also leaves behind a protective coating that prevents future carbon adherance. This coating is less than 100th of a micron in thickness, so it will not affect first shot accuracy.” For more info, visit SharpShootR.com, or call (785) 883-4444. Share the post "Great Results with New Carb-Out Solvent"